NORCAL MINIS Wishes All Have A Very Happy And Prosperous 2013! 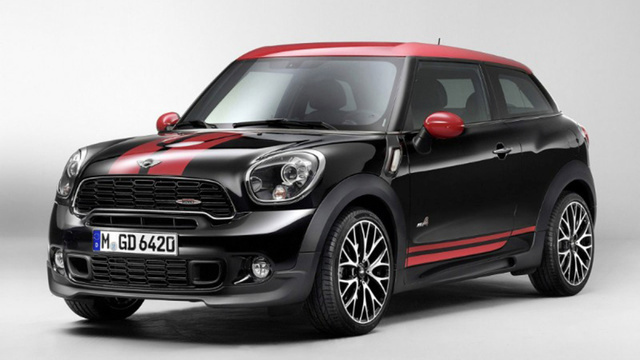 The big news, according to this BMW Group PressClub USA press release, is the MINI Paceman John Cooper Works will make its world premiere at the 2013 North American International Auto Show, but that's not all. Read the press release for further details. The Rally begins January 5, 2013. MotoringFile reports MINI of Chicago has dropped the price on the limited edition MINI Goodwood, appointed by Rolls Royce, from $52,000 to $39,995. If you’re interested give MINI of Chicago a call at 877-793-0218. Babbling like a moron and lightly demonstrating blizzak performance on Mini Cooper S with Magna exhaust and K&N intake. 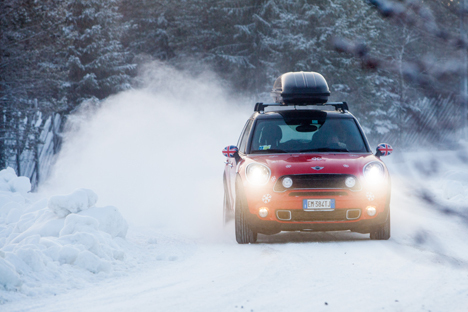 core77 recounts racing MINIs with ALL4 in the ice and snow on a frozen race track with Rauno Aaltonen. 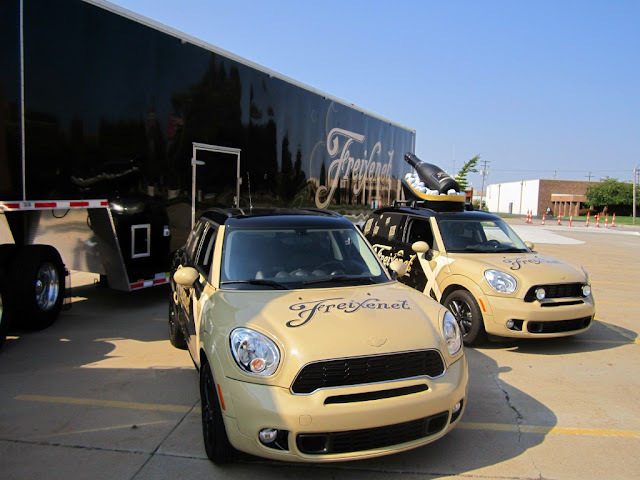 autoevolution has a wonderful photo gallery of this snake vinyl wrapped MINI Cooper Cabriolet. If you want a soft-top with a decent amount of poke and a vehicle that’ll also massage the ego, the Cooper S Roadster is certainly worth considering. 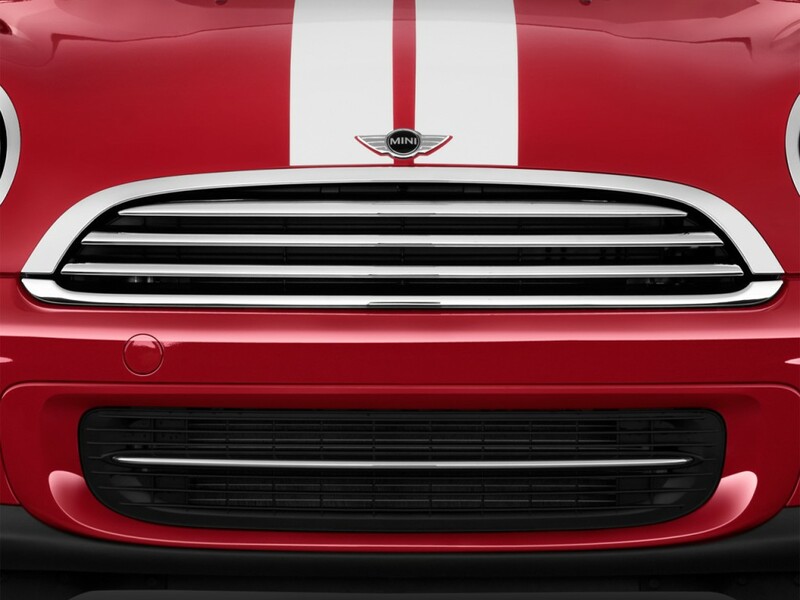 This MINI is a nice, squat, muscular looking car, but at the same time it’s almost a caricature. Inside the cabin the brand’s familiar design touches are all present, including the huge speedo and bank of toggle switches. The Roadster’s party piece is the retractable roof. It can be raised or lowered in 10 seconds and at speeds of up to 20mph. Even with the cloth down, the car still keeps its style-led stance. Unfortunately, we wouldn’t. The Roadster has some endearing qualities and is a capable car on the right road. But for UK carriageways the overly firm ride is a step too far. However, to some the sense of style and pizzazz offered by the soft top and the cachet the MINI badge brings with it will be enough to overlook the flawed chassis dynamics. It’s a good car, just not as good as it could be. Sacramento –With 2013 around the corner, the California Department of Motor Vehicles (DMV) reminds motorists of several new laws that will ring in the New Year. Among the new laws that take effect in January is AB 2020, which deletes the option for persons alleged to be driving under the influence of drugs to choose a chemical test of their urine for the purpose of determining drug impairment, with certain exceptions. Other new laws will establish a new license plate, protect car buyers from “buy-here-pay-here” car dealers in purchase transactions, establish safety standards for autonomous vehicles and impose a new fee on vessel owners. The following is a listing of selected motor vehicle and driver-related laws that will take effect on January 1, 2013. “Buy-Here-Pay-Here” Car Dealers. Two new laws are directed at used car dealers that assign less than 90 percent of their conditional sales and lease contracts to third party lenders; and therefore provide direct financing to car buyers. One of the new laws defines these used car dealers as “buy-here-pay-here” dealers. According to the Arab Times Team MINI Kuwait, together with its sponsor Ali Alghanim & Sons Automotive, is getting ready for the third round of the Kuwait Rally Championship 2013, that will take place December 29, 2012. Meshal Al Nejadi and co-driver Ali Al Shamali plan to set the pacein their MINI John Cooper Works S2000. The Championship launched October 19, 2012; includes a total of six rounds; and will officially end on March 23, 2013. "Present It! : The MINI Paceman | Drive It!" motorsport.com provides a photo gallery of what it calls the Best of grid girls 2012. Who are we to argue with that? 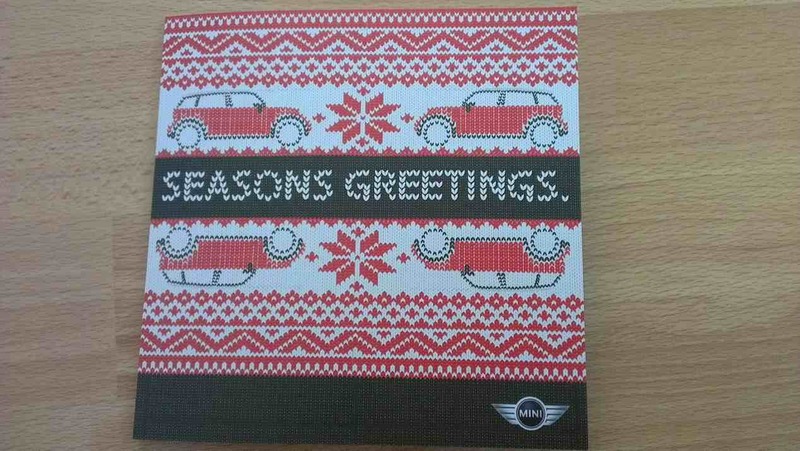 The 2012 Holiday Lights Rally Nights Rally provides the backdrop for these Holiday Wishes from MINI of Concord. Front Camber or Caster: There are no built-in factory adjustments for front camber or caster. The only way to adjust these angles is to purchase adjustable upper strut mounts. These kits can typically adjust camber by ±2.00º and caster by ±0.75º. 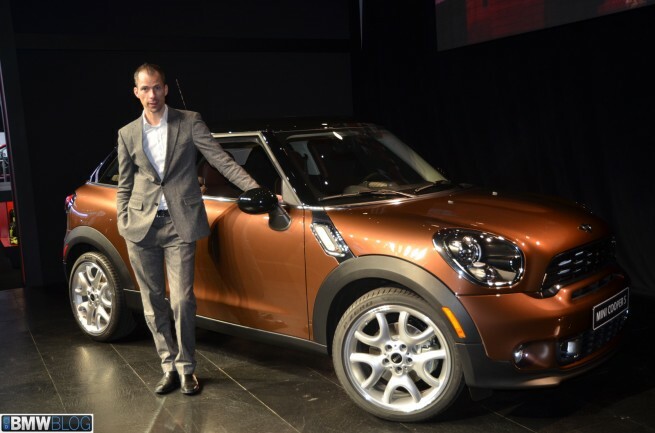 ONE in every six cars sold by BMW Group is now a Mini. Sales for 2012 are up by more than seven per cent and on course to hit 250,000.
edmunds.com reports the MINI John Cooper Works Paceman will debut at the 2013 Detroit Auto Show and provides an overview of the itms thst will make the JCW Paceman distinct from other Paceman models. MINI Space provides a retrospective on MINI's accomplishments, releases and events during 2012. After learning of Big Brother's imposing will, we were less excited to explore the dynamic handling capabilities of our new Man-Bug. To our surprise, the electronic nannies were more supportive than restrictive to these activities, dialing out front-end push when possible and allowing for mild amounts of yaw. Pleasant as it was, the Mini's lean mass and handling agility allowed it to fly through the cones, around the skidpad, and away with our vote as the unanimous winner of this compact showdown. Dashing Through The Snow . . . In a top down Carbiolet . . . It's not that we don't see a need for this car. It's just that since we now know Mini will put a JCW badge on anything, we are beyond caring. Do any of you out there in Jalop-land care about the Paceman? Do you want one? . . .
Watch the carnage on the Nordschleife track during 2012. Fortunately, all that appeared to have been hurt this year was machinery and pride. 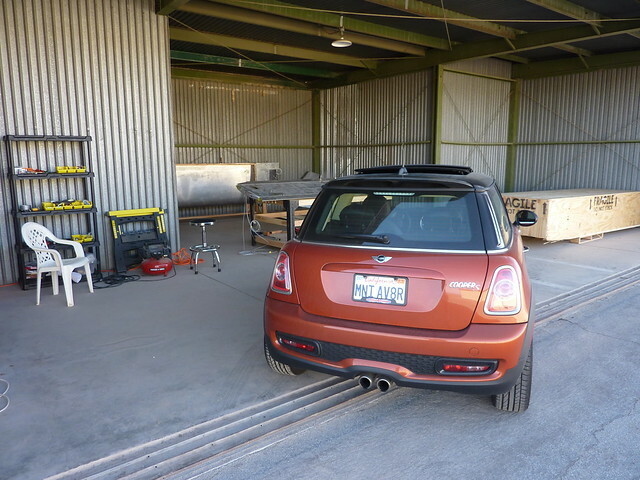 "The Car MINI Had To Do"
That is what Motor Trend claims about the 2011 MINI Cooper S Countryman ALL4 and then asks, "Did It Do It Right?" in its verdict on its long term test vehicle. NORCAL MINIS Wishes You A Very Merry Christmas Day! Did You Get Your MINI A Christmas Sweater? Blazing Needles made this one. It yarnbombed the MINI masterpiece at Utah Arts Festival 2011. Following Diana tells us to click here to find out how to participate. Gold medalist Alistair Brownlee takes a spin in the new MINI Paceman and answers questions posted on twitter and read out via MINI Connected. 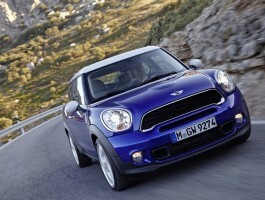 BMWBLOG: Speaking of the next MINI design, can you tell us some words about where you are heading to? Anders Warming: I think I’ve mentioned it in the first question as well, it goes for any new MINI that we’re working on in a daily life. You’ve seen this with the Paceman. We want to make sure that every MINI is based on this philosophy of knowing where it comes from and having a lot of innovation. The reason why I use the word “heritage” is because heritage is got more to do with what’s in your blood veins, what’s flowing in your blood veins. And I’m not a big fan of the word “retro”, because it actually comes from the word “retrospective”, meaning you’re looking the wrong way. I like to look forward, knowing that heritage is sort of under your coat, you have to carry it, but with the element of innovation we look forward. Innovation also means that we’re going to be focusing increasingly on issues like connectivity, because that’s part of the life that people live, and obviously we also have a big display as far as the connectivity today, but this will also be a central pillar in the future design of MINI interiors. One thing that I always say and that is very important for me to put is that the round display in the center of the MINI is here to stay. I believe that the central display in each MINI is an icon, and this is where all our connectivity really has to have a inner stage, where people could really live their connected life through the central display. So some of the questions that have been “Will MINI always have this round display in the middle?”, I will definitely say “Yes, confirmed”, because it’s such an important, strategic and iconic feature. BMWBLOG: That is somehow anticipating our next question: what technical innovations will have a major influence on design? Anders Warming: We mentioned one already: connectivity. I believe that the way we sit in the interior and the way we feel connected to the world is a huge, important thing, We also displayed that in the Concept Rocketman shown last year; that really shows what connectivity could be like, how it could be lived. Another thing that is very important for me to the interior, as far as innovation goes, is that material quality, we focus on this premium level of materials, in order to make sure that we maintain that, and we also introduced new materials and new kinds of use and patterns that takes it to different levels. We believe customization is in the forefront and that customization only really makes sense if you’re basing it on a certain level of quality. The third thing I want to mention in terms of innovation is the focus on small, on light weight, making sure that the word MINImalism is part of our language. So we really have precision in the form language and we keep it as short and as focused as we can; lightweight and Minimalism is in the forefront. "Is There A Problem Officer?" The action on the demanding tracks is similar to that on the circuits in the MINI Challenge – only on a tricky, icy surface rather than on asphalt. Can We Show You A Few Slides? Advent Track Day School of Racing Hockenheimring. Maybe it was the Jello but a press release at BMW Group PressClub USA claims that the Mayan calendar was simply misinterpreted and actually predicts a new period full of exciting challenges for MINI especially as MINI expands in Guatemala and Central America. By getting a vinyl wrap! MINI Motorsport highlights Nani Roma who won the overall motorcycle category in 2004 when the Dakar Rally event was still held in Africa, and came in second last year for the X-raid Team in the MINI ALL4 Racing. He will try again to win it all in the four wheel class during the 2013 Dakar campaign underway between the 5th and 20th of January 2013. So does the Mini Roadster deserve a place at the table? Absolutely. It’s a great urban cut-and-thruster. An excellent fine weather cruiser. It would be great for a getaway weekend, especially if you kept things within a couple hours’ drive. It also has a different vibe than the Convertible – a little more daring, a bit more style statement. And most notably, a few days after we returned our tester, we really missed it. And there are only a handful of vehicles we drive every year that makes us feel that way. The new limited edition MINI JCW GP II will not make its North American debut until the 2013 North American International Auto Show, however, according to The Motor Report the vast majority of the Australian allotment of 55 of the 2,000 that are to be made worldwide have been pre-sold. Worldcarfans.com carries the first photos of this Paceman variant. Even in a MINI. 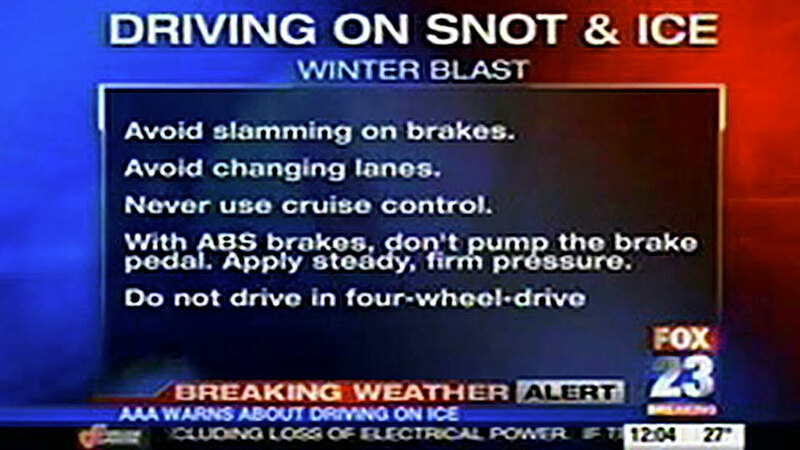 Oh, and check your tire pressures and tread. autoevolution comments that, in 2013, the Oxford Plant (where the new MINI Hatchback is produced) will mark 100 years of car-making. MINI will celebrate on March 28, which is the day the first Bullnose Morris Oxford was produced at the factory a century ago. The plant has built over 11 million cars under brands including Austin Healey, MG, Wolseley, Riley, Austin, Mini, Vanden Plas, Princess, Triumph, Rover, Honda, Sterling, the founding marque Morris and two million MINI. The New York Daily News reports that BMW may be looking to produce MINIs in India. BMW already sources many of the parts used in the MINI from suppliers in India. A MINI takes on a BMW M3 E92 Competition. Guess which is faster on this track? Hello, MINI! Where are the North American MINI diesels? At the Los Angeles Auto Show 2012 Complexrides shoots the MINI Cooper S Paceman and assembles a cool photo gallery. Chuck Hill, who works at Seattle Mini, a car dealership next to Animal Critical Care & Emergency Services, said he came outside and saw smoke coming from the roof of the building. Firefighters, dispatched at 3:30 p.m. on Monday, arrived to find that a laundry dryer had caught fire in the facility. Smoke from the fire forced the evacuation of about 20 animals, including some in a medically fragile state. Hill and his coworkers offered to take in the animals and keep them warm as staff from the facility worked out what to do with the pets in their care. The dealership, which welcomes customers’ dogs, already had a bowl of water and dog snacks in the lobby. In fact, the company’s mascot is an English bulldog and a few toy bulldogs can be seen around the dealership. As the last of the dogs left the dealership, some sent to other facilities, Hill swept up dog hair that accumulated on the floor of the business. He said that later on Tuesday the dealership has a top executive from Mini Cooper stopping by for a visit and that the dealership needed to look good. In the eyes of their four-legged neighbors, the warm dealership stocked with water bowls and dog snacks couldn’t have looked better. 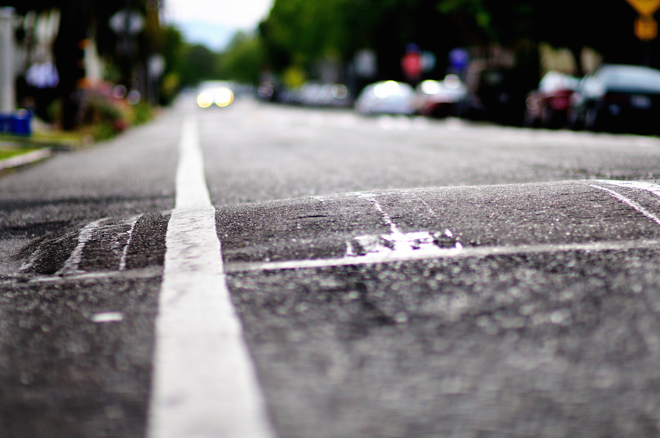 WIRED has an article, citing Doctors at the University of Oxford and Stoke Mandeville Hospital, that pain experienced when going over speed bumps is very useful in diagnosing appendicitis. For a second year in a row NORCAL MINIS will attend Stormin' Norman's MINI Thunder at Thunderhill Raceway, Willows, CA, Sunday, February 17, 2012. Ever wanted to learn how to race on a track in y0ur own MINI? Here's your opportunity. You will need a SA 2005 or newer rated helmet. That is “A” for automotive and not “M” for motorcycle. Helmets are available for rent at the track @ $35/day. Be sure to get to the track early to get your helmet. If you decide to purchase a helmet I suggest that you purchase a SA 2010 or newer. This event is open to all MINI/Minis of all types and models. You may notice other cars entered. These are coache's and instructor's cars. Saturday Night's dinner and no-host beverage service and Sunday's breakfast are being provided directly by Thunderhill Grill and not MINI Thunder IV. Thunderhill Grill is handling the money associated with that. There is an ATM at Thunderhill. Maximize your time on the track by studying this Turn By Turn Guide at Trackpedia.com. From the 2002 MINI Cooper, the brand’s product line has expanded to include everything from a Coupe (and corresponding Roadster) to a crossover, the Countryman, which is MINI’s first model to offer up an all-wheel drive option. All versions come in standard-performance Cooper models, higher-performance Cooper S trim and highest-performance John Cooper Works variants, giving buyers a truly impressive range of vehicles to choose from. MINI of Concords' Karla Hirayama delivered a Countryman FULL of toys today to Children's Hospital Oakland. Thank you to all who made these donations possible. autoevolution provides a nice gallery of these female auto show workers. MINI of Concord announced on facebook that it will hold its end of the year "MORE MINI FOR YOUR MOO-LA" Sales Event Friday, December 28, 2012 from 10 a.m. to 6 p.m. Watch their facebook page for further announcements and details about this event. UKPylot has been a new MINI owner since the early days of the new MINI. He operates the blog UKPylot's MINI Blog since at least July 2003. Recently he acquired a new MINI Cooper S and provides his observations in this post. The conclusion, then, has to be that the Countryman is indeed a Mini. It has the same opinion-splitting fascia as the regular car, the same focus on aggressive steering and ride quality (out of sorts though they are) and only a modest nod in the direction of extra practicality. If you're desperate to stay with the Mini brand as you move into family life, it might well fulfil your requirements. Just don't expect it to be a true all-rounder. Atlantic MotorCar Center provides a case study on the MINI Cooper Timing Chain, the cause of the death rattle, how to prevent it and how to fix it once and for all. The system is based on an electromagnetic centre differential and distributes drive force at continuously variable levels between the front and rear axle. In normal situations on the road, up to 50 per cent of the drive torque is directed to the rear axle – in extreme situations such as when driving on ice or snow this figure can go up to 100 per cent. This indicates a power distribution change to a rear wheel drive bias for new ALL4 equipped MINIs. BikiniCelebrities @ YouTube provides this video of Debbie Gibson parking and exiting her MINI. MotoringFile recounts a few days of December top down motoring in the MINI Roadster and provides its cold weather observations. Use the MINI UK facebook Christmas Paper Maker App! It looks so hurt, sad and lonely! Read it at core77 which tells the story with great video! The cars.com KickingTires blog photo gallery is here.